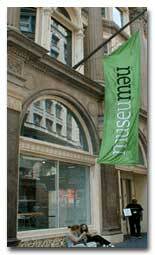 Since its grand opening in March 1998, the New Museum Bookstore has been a hotbed of activity with shopping, readings, performances, and book signings. Offering the most comprehensive selection of critical and contemporary catalogues, artist monographs, and magazines, it has become the place to relax, browse, read, and catch up with friends downtown. Constantly expanding its merchandise, the Bookstore is an excellent place to find unique gifts. Jewelry, lamps, quilts, and other cool, artist-designed items for the home, limited editions, and "new" baby jumpers are just some of the great gifts you'll find here. An interactive site complementing the New Museum's high school arts program, Visible Knowledge, offers educators and their students worldwide an opportunity to open classrooms and studios online. There are also multicultural and interdisciplinary curriculum units, incorporating N.Y. State Learning Standards, that can be downloaded or discussed online in the forums.